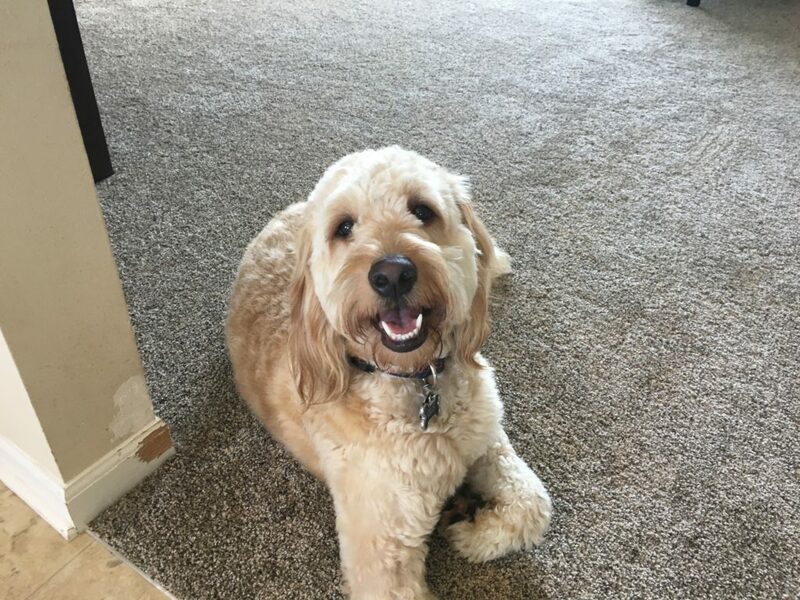 Gus is a one-year-old F1 Miniature Goldendoodle who gets over excited, steals things for attention, does not like his kennel and jumps up on people like crazy when they first arrive. Ive worked with a number of Labra and Golden doodles and they are usually a higher energy dog, especially when they are young. Gus was no exception. He ran around and attempted to jump on me with quite a bit of determination. I sat down with his guardians and immediately went over some non verbal communication cues that they can use to disagree with unwanted actions or behaviors like Gus’s jumping. I call these Escalating Consequences and I came up with them after observing how dogs interact with one another which is why most dogs respond to them right away. After going over the communication cues with his guardians, we repeated the door answering exercise, but this time we had a much different result. By communicating with Gus in a way he understands with good timing, his guardian was easily able to stop Gus’s unwanted behavior before he really had a chance to get out of control like he did for my greeting. This is a great example of how important disagreeing with good timing is when communicating with dogs. While it was necessary to disagree with Gus’s over excited jumping behavior, I always look for ways to eliminate the behavior by rewarding desired actions using positive reinforcers. Most people know how to use treats to motivate or reward a dog, which is very helpful (especially for dogs under three years old), but I wanted to show the guardians how they can use their love and affection to train Gus to sit down rather than jump up on people for attention. This technique is often referred to an Manding. A few years ago I developed a technique called Petting with a Purpose that helps dogs learn to sit or lay down to communicate to their humans they want something. I spent the next few minutes explaining how the guardians can use this technique to help Gus learn to control himself better. If everyone in the home asks Gus to sit or lay down and only pet him after doing so, they will engage in mini dog behavior or dog obedience training session each time they do. This really helps a dog adopt more of a follower mindset which will translate into better behavior from Gus in the future. One of the other major issues Gus had was a reluctance to go into the kennel. It had gotten so bad that he was starting to show signs of separation anxiety. This usually happens when people fail to prepare their dog for being alone. Dogs are hard wired to be social creatures so being alone is something that many canines struggle with if their humans don’t help them practice being alone properly. To help Gus get over his fear of the kennel and deal with his Separation Anxiety, we moved to the basement with a big bag of high value meat treats with a strong scent. By breaking down being in the kennel into small individual steps and waiting for the dog to get comfortable before moving onto the next step, it shouldn’t take long for Gus’s guardians to help him learn to relax and actually enjoy being in his kennel. By the end of the session, Gus had adopted a more relaxed demeanor. He was no longer hesitating to go into his kennel, was respecting people’s personal space and was sitting to ask for attention instead of jumping up. Practice at the kennel exercise, petting with a purpose, consistent enforcement of new rules and use of the new communication methods should help everyone stay on the same page from now on.